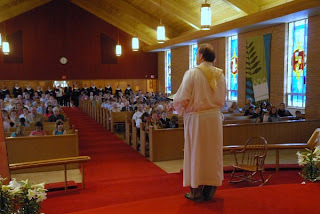 Worship is central to the life of HPUMC. Though much of Christian faith is a personal matter between us and God, coming together with other Christians to praise God and share with each other is vital to sustain us in the midst of the challenges that come our way. We love to worship, learn and pray together. We trust that God is present with us and in us during these special times each week. Highland Park offers a variety of worship experiences to encourage people to connect with God. The 6:00 p.m. Saturday Evening Beginning Anew worship service meets in our fellowship hall every week. This informal service features various genres of Christian music and messages on issues people face everyday. The messages are often times interactive and seem to be more like conversations than sermons. We start with a Pot-Luck Supper each week. Each meal will begin by 5:30 pm with the Worship Service begins at 6:00 pm. The doors will be open by 5:00 pm, so you are welcome to come early. We want to provide a relaxed and comfortable place to fellowship with one another, to make new friends and to feed our souls, as well as our bodies. The Sunday 8:00 a.m. service offers the intimacy of a small church experience in our chapel. This warm and inviting service tends more toward the traditional in music and liturgy in a setting that is cozy and charming. The 10:30 a.m. blended worship service is in our large worship center. It offers some elements of a more formal experience with organ, choir (except in the summer) and other special music, all set in an area framed by stained glass windows, large crosses and banners. You will find leadership of this service to be open, inviting and encouraging. Don’t expect a dress code. The music we share together is a mix of traditional and contemporary. We celebrate the Lord’s Supper on the first Sunday of the month at the 8:00 am and the 10:30 am services. Everyone who comes is invited the share this gift of our Lord and Savior Jesus Christ, regardless of membership in the church. Highland Park encourages diversity in worship. We try to draw upon many worship resources and expressions. Our worship year includes a number of special services that highlight certain worship styles, Christian events and Biblical traditions. Everyone appreciates a change of pace and style that keeps things interesting. If you have a family with young children, you will find that we welcome you to worship. You are free to keep your children with you through the service or take advantage of our wonderful child care facilities and staff. Children and youth are encouraged to participate in various ways in worship and people love to get to know them. We strive to accommodate the needs of people with special needs. Ample handicap parking is available in the areas surrounding our building. Some entrances are equipped with ramps to make them readily accessible. Hearing receivers connected to our sound system are available from any of our ushers. Large print worship bulletins and copies of music we are singing are available for both the 8:00 am service and the 10:30 service.